South Wales based Selwyn’s Seafood is looking to tap into the growing global demand for seaweed products with the opening of a specialised roasting unit. The new facility was officially opened by Deputy Minister for Farming and Food, Rebecca Evans, and marks the latest expansion by the family-run business. Selwyn’s has been assisted in its development by Cywain Fisheries – a European Fisheries Fund (EFF) supported project dedicated to adding value to the fisheries sector across Wales. While the new seaweed roasting unit has also received grant funding from the EFF. The unit has enabled Selwyn’s to create a range of crispy seaweed snacks, which it launched this summer. Already proving very popular Selwyn’s Seaweed Snacks come in three flavours: Sea Salt & Vinegar, Coconut & Chilli, and Honey & Sesame. The company was founded by Selwyn Jones, who travelled the country selling traditionally processed seafood including cockles, mussels and Laverbread. Now run by the third generation of the Jones family – grandson Ashley and his wife Kate – the business, has grown steadily with both UK and overseas customers. 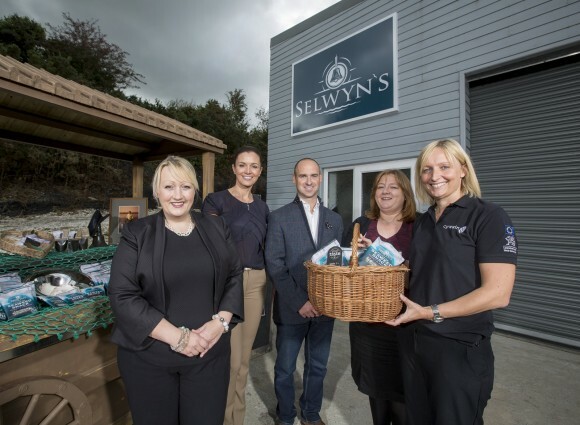 The development of the Seaweed Snacks has been a natural progression for Selwyn’s, which has been producing seafood at its purpose-built base at Llanmorlais for nearly 70 years. Following the recent Speciality Food Show in London interest in the Seaweed Snacks has been shown from potential customers in Asia, Italy, Germany, Austria and Sweden as well as UK multiple retailers. During her visit the Deputy Minister officially opened the new roasting facility which represents an investment of £500,000 by the company and a potential doubling of its workforce taking the number of full time and part-time positions to 20. The company is also working in partnership with Tidal Lagoon Swansea to develop Europe’s first organic seaweed farm with the aim of providing a sustained and year-round local supply of seaweed. (left to right) Rebecca Evans AM, Deputy Minister for Farming and Food; Kate Jones, Selwyn’s Seafood; Ashley Jones, Selwyn’s Seafood; Bethan Jones, Welsh Government; Lowri Edwards, Cywain. Launched in 2011, Cywain Fisheries is funded through the European Fisheries Fund with match funding from the Welsh Government. Cywain Fisheries helps the fishing sector add value to primary produce through developing new products or markets, with an emphasis on collaboration. The hope is that effective collaboration will assist in the creation of a sustainable future for the sector.